Unfortunately, as I mentioned, it was summertime when I went down there, so I discovered the water flow was far more powerful than when the photographer took the screensaver image. I got myself down into the creek and walked across to what looked like a small staircase leading behind the falls, but they were far too slippery to step on. 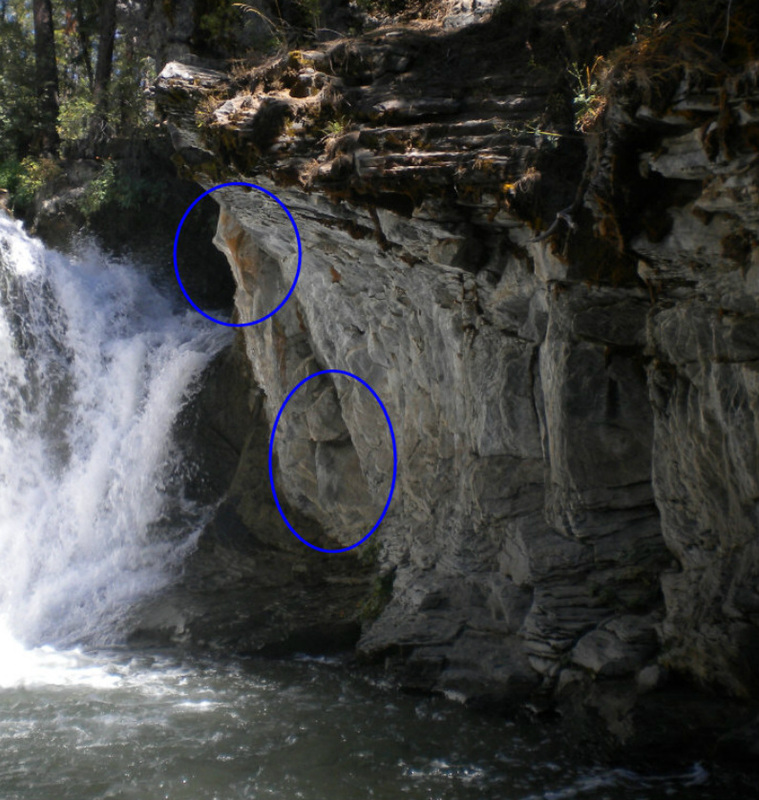 The falls were coming down so hard, it was difficult to pick up the image with the camera of the large face behind them......but it was there and you can see one of the eyes and part of the mouth. However, I could not distinguish the smaller facial image of the lion while there. I wonder, is it possible for the camera to pick an image up the human eye cannot see? It was not possible to take a picture looking at the face standing directly in front due to the water flow. This is the view from standing at it's side. This was simply amazing. I walked up to it and ran my fingers down the forehead, nose and side of its face. The orange and white face....Bird....Beast...Other Race? was almost like a marble texture, very smooth to the touch....and the only place where this particular type of orange rock was. The eyes were solid, those are not holes. I got a real strange feeling as I stood underneath it...... A real strange feeling. As I drove home I had to wonder what in the world was here in ages passed. Now, to put all these faces and the possibility this was Mother Nature's doing to the test, as I mentioned, I spent days and days cruising around Oregon looking for more images from Google Earth that looked like faces. I couldn't find anything else, but maybe I wasn't meant to, maybe that is for others. So I thought okay, I have not found them anywhere else, so what if it WAS a fluke of Mother Nature or optical illusions or my imagination working overtime? I'm wondering how that explains the woman from New Mexico sensing the faces without me disclosing anything about them? And in the same token, how does that explain me personally sensing the faces while cruising around the land, but not finding them until she read the script? Very odd experience, it felt like a door opened to me because I began to rapidly find one face after another. 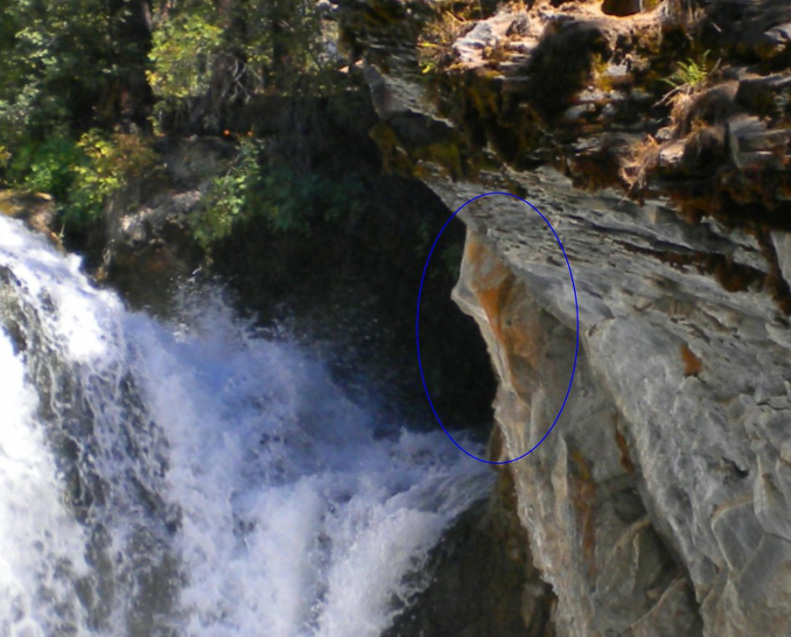 And how would that explain that ONLY in that particular area in Oregon there are these "grouped" faces? What if there was indeed an ancient, long forgotten civilization that created those faces so massive that one can only discern them from several thousand feet in the sky, which they happily face...........and what if through one ice age and cataclysm after another, it all got buried or distorted and what is left are remnants.